There can be several reasons for your pet’s abdomen to look bloated or distended. They range from not a big deal to life-threatening. A condition called Gastric Dilatation Volvulus, known as GDV or Bloat, can occur suddenly and rapidly progresses to a life-threatening emergency. It is typically seen in dogs although other animals can get this condition. Some things that can predispose dogs to bloat include eating a large meal quickly, a deep chest, and being older. GDV occurs when the stomach distends like a large balloon and twists on itself (torsion), cutting off blood supply to the stomach and surrounding tissues. ​Ingesta, (food and water), cannot leave the stomach and continues to ferment building up gas within the stomach. The stomach presses against diaphragm making it harder for the pet to breathe and get enough oxygen into their system. These pets start panting heavily and are painful in their abdomen. ​Standing and stretching, trying to get comfortable and being reluctant to lay down. Drooling and retching but not being able to produce anything. The longer this condition is present you pet may go into shock and collapse. 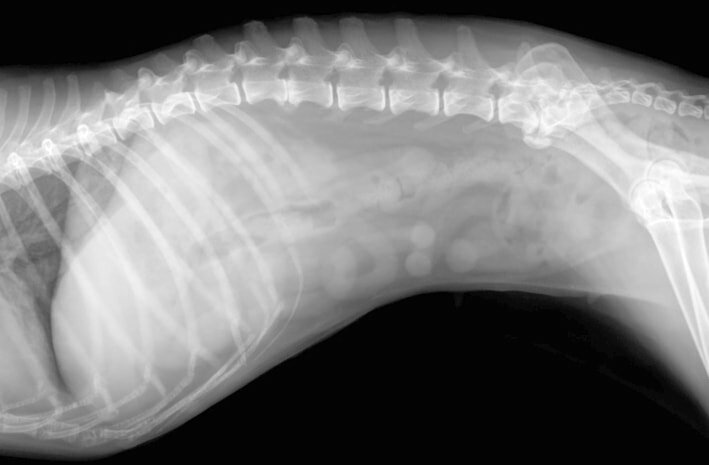 To diagnose a GDV it is critical to take a radiograph of the abdomen. 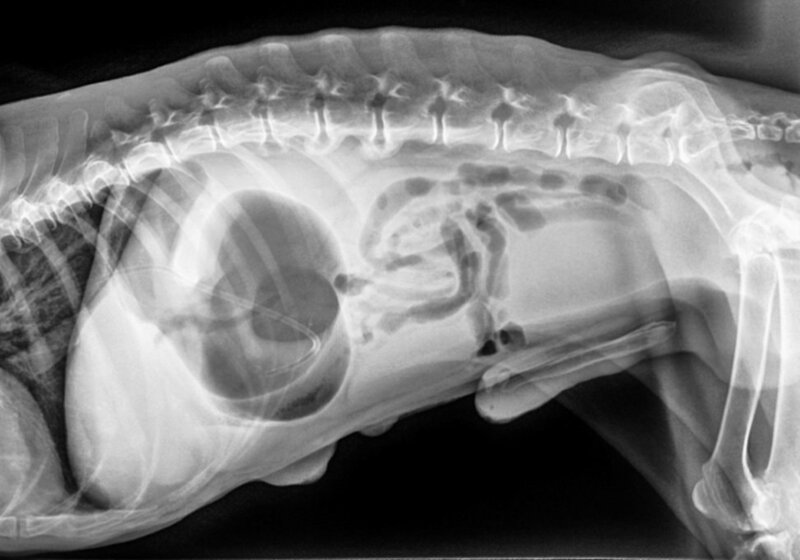 The classic appearance of a large gas filled stomach is easily seen on xray. In the image of the radiograph on the left, there is a large black area in the most cranial portion of the abdomen (left portion of the abdomen). This is the stomach filled with gas and much larger than normal. In comparison, the image on the right is of a normal dog. It is difficult to see the stomach on this xray since it is small and not filled with air. This is a critical situation that if not corrected can lead to death. First and foremost, your pet will need to be stabilized by a veterinarian including intravenous fluids and possibly oxygen. Decompressing the stomach is key and may or may not need anesthesia. Many times GDV requires surgery to correct the torsion of the stomach and evaluate the other organs in the abdomen to ensure permanent damage does not occur. The surgeon may do a surgical attachment of the stomach to the abdominal wall to help prevent twisting of the stomach in the future, this is called a gastropexy. ​GDV pets will typically stay in the hospital for at least 24 hours after surgical correction to monitor for any issues after their procedure. Unfortunately we still don't know 100% what causes this, but we do know some ways to help minimize the risk of bloat happening. ​Feed smaller more frequent meals: Dogs who ate 1 large meal a day were found to be more at risk. Slow down eating: Helping your pet slow down while eating can help prevent a larger intake of air as they are eating. Using bowls such as puzzle bowls can help slow dogs down while eating. Gastropexy: a prophylactic gastropexy will prevent the stomach from flipping in the abdomen causing GDV. It doesn't prevent the stomach from filling with air, but won't allow the twisting that is what kills off tissues from lack of blood flow. This can be done either with traditional abdominal surgery or with laproscopic surgery. If your pet’s abdomen appears to be bloated and it has been a gradual change, over several weeks, it is good for your pet to be evaluated for conditions such as Cushing’s Disease, heart disease, or cancer. There are different kinds of fluids that may accumulate into the abdomen that indicate different disease processes. A pendulous abdomen that has a ‘fluid wave’. A fluid wave is when you tap the abdomen you see a wave spread across the belly. Think of a water bed. What kind of fluid is it? A veterinarian may need to do an ultrasound guided aspirate of the fluid to see what kind of fluid is in the abdomen. Clear fluid can indicate heart disease. Right sided heart failure can cause fluid to “back up” into the abdomen. Cloudy fluid can indicate an infection or severe inflammation in the abdomen such as sepsis, or pancreatitis. Bloody fluid, or a hemoabdomen, can indicate a bleeding episode from trauma or a ruptured mass, or rodenticide toxicity. Yellow/yellow tinged fluid can be urine, FIP, or liver disease. The different disease processes are all treated differently but can be surgical or treated with medications. ​Sometimes a pet may have a potbellied appearance. This can be associated with medications such as prednisone or can indicate a metabolic disease such as Cushings. A pet on long term steroids like prednisone, may lose the strength of their muscles and their abdomens will look pendulous. After decreasing or stopping the steroids this usually corrects itself. If your veterinarian is concerned about Cushings Disease an ultrasound and lab work can diagnose this and it is treated with medications. Visit the endocrine page to find out more about Cushings Disease.